You are here: Home / Skill / Being Funnier Fast…Only 15 minutes a day. 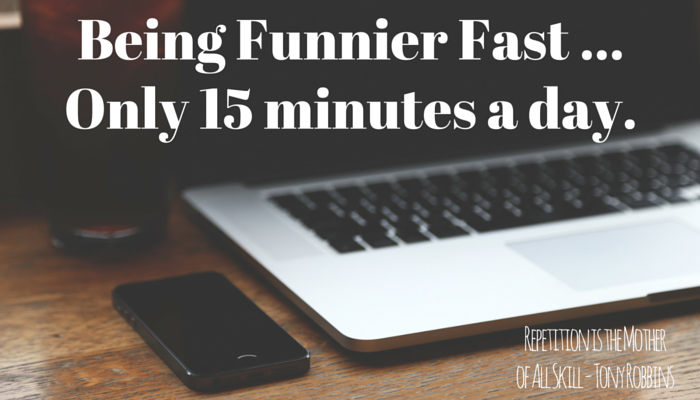 Being Funnier Fast…Only 15 minutes a day. Humor is a skill. Making people laugh and being funnier is a skill. Therefore, if one wishes to develop or enhance a skill, what is the best approach to take? In The Little Book of Talent: 52 Tips for Improving Your Skills author Daniel Coyle’s second tip is to spend 15 minutes a day engraving the skill on your brain. What’s the best way to begin to learn a new skill? … Many hotbeds use an approach I call the engraving method. Basically, they watch the skill being performed, closely and with great intensity, over and over, until they build a high-definition mental blueprint. Your material looked liked you’ve been writing for me all your life. Mr. Hope, I have, only you just didn’t know about it. As Gene Perret shared and as Daniel Coyle shared, if you want to get good at something, spend 15 minutes a day engraving the skill on your brain. Engraving is exactly what Gene Perret was doing when he copied Bob Hope’s monologues. Do you have a favorite comedian or humorous speaker? Do a quick YouTube search and find a video. Next, grab a pen and a notebook and watch the video. Every time the the audience laughs, hit pause and write out what was said. You’ll probably have to back the video up a bit to get the exact wording. Watch the video again and pay attention to the facial expressions, the pausing, the timing and pacing. Next, practice delivering some of your favorite lines. Follow these steps and you can become funnier in only 15 minutes a day using the engraving technique. To help you get started, I’ve included a video of Brian Kiley, Conan O’Brien’s Head Monologue writer. His joke structure and delivery is excellent. Leave a comment and let me know how it goes.